Walt Disney Animation Studios returns to the Hundred Acre Wood with "Winnie the Pooh", the first big-screen Pooh adventure from Disney animation in more than 35 years. With the charm, wit and whimsy of the original Winnie the Pooh featurettes, this all-new movie reunites audiences with the philosophical "bear of very little brain" and friends Tigger, Rabbit, Piglet, Kanga, Roo—and last, but certainly not least, Eeyore, who has lost his tail. "Well a tail is either there or it isn't there," said Winnie the Pooh. "And yours isn't… there." On top of Eeyore's misfortune, a minor misunderstanding sees owl send the whole gang set off on a wild quest to save Christopher Robin from an imaginary culprit. It turns out to be a very busy day for Pooh bear who simply set out to find some hunny. Narrated by John Cleese, featuring all-star voices including Jim Cummings and Craig Ferguson and music from US superstar Zooey Deschamel, Winnie the Pooh is inspired by five stories from AA Milne’s books in Disney’s classic hand-drawn art style. 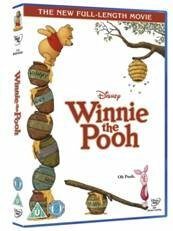 Created by Burny Mattinson (The Lion King, Beauty & the Beast) and Andreas Deja (The Little Mermaid, The Lion King) Winnie the Pooh is executive produced by John Lasseter and is available to buy on DVD from 22 August 2011. Warner Bros' Yogi Bear DVD release. A tale of modern-day outlaws? Do you want to be in a Harry Potter poster?